Today's guest, a mighty hurler from baseball's deadball era, won 373 games in a comparatively brief 17 seasons, averaging nearly 22 wins per year. This included 30+ wins 4 times and 20+ for 12 years in a row. 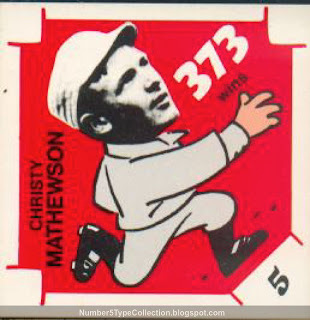 Mathewson made Cooperstown's "first cut" of 5 Hall of Fame inductees in 1936, joining fellow non-paraliel legends Babe Ruth, Ty Cobb, Walter Johnson, and Honus Wagner. Including 2009 inductees Rickey Henderson, Jim Rice, and Joe Gordon, the Hall now honors a total of 231 players. Every player in this 30-card set (full checklist here) reached one of three hallowed marks. In 1980, only a select few players qualified for that elite list and this issue presents them on glossy, superwhite card stock reminiscent of Upper Deck's early work. As blogged by SCD "big book" editor Bob Lemke on July 20, 2009, this set was curiously reprinted sometime after the original release. We can hope Mr. Laughlin himself did the work to satisfy a need for more orders--otherwise, why go to the trouble for an oddball release with fairly low current demand? Perhaps we all live in Glenn Hubbard's world, where some things have no explanation. By his own reckoning, my dad amassed the neighborhood's largest baseball collection as a kid. Given the era (1950s and 60s) and occasional "find" made over the years (see 1953 Red Man NL #5, Roy Campanella), it must've been a sweet ensemble of cardboard. Just about every visit involves a baseball game, lengthy discussion, or nostaligic ramble on Brooklyn vs. L.A. We haven't played catch mano-y-mano in a number of years, but the memory stays strong. Carl Crawford Cards, a #5 type collection follower, tracks not only his favorite, eponymous player, but also a variety of vintage sets and family stories. His July 21, 2009 post includes a similar familial overlap, 1976 Topps' own Father & Son card for Gus and Buddy Bell. I liked the card's story of Gus bringing Buddy back to the game after a bout of depression. The younger Bell went on to collect 2500 hits, make several All-Star teams, and win 5 Gold Gloves. That's a lot of success to be thankful for! Carl Crawford Cards posted almost 70 entries in his first 3 months of writing, an impressive kickoff in both quantity and variety. I look forward to reading more as time goes on. Yesterday's trip picked up a Gems of the Game re-gather of packs from the last couple of decades. They contain mostly Topps, Upper Deck, and Fleer high-production remnants, with the slim possibility of something better. First thought: "Look, another sucker's bet to enrich the ghost of Sam Walton." That said, $20's not a terrible risk. Might it turn up treasure, a la A Pack A Day? Let's check the contents. My GotG box contained 16 packs with 3 duplicates. Most of the Upper Deck sets picture Derek Jeter on the front. Others (primarily Topps) show Cal Ripken, Manny Ramirez, Josh Hamilton, Joba Chamberlain, Alex Rodriguez, David Ortiz, and Ryan Howard. With no high-value sets on the list, I adjusted my hopes down to "autograph" or "game-used." As things played out, the best it could do was "interesting." Don't adjust your TV set, the 1982 Fleer photos really are that blurry. Yankee Stadium Legacy #5434 (2008 Upper Deck First Edition). Mattingly's the only Yank I care about and this one features kung-fu mullet action. 2008 Upper Deck Series I #369 Padres Team Checklist. Jake Peavy, full leg kick, bright yellow Pads uniform. Let's call it "visually arresting." 2006 Upper Deck First Pitch #149 Ryan Howard. Great shot at moment of impact, with helmet, gloves, bat, and ball in alignment. 2007 Upper Deck Series II #591, Manny Ramirez running hard down the first base line. That's proof it happened at least once. Joe DiMaggio, The Streak #35 (2007 Topps Series II). The Clipper homers off Hal Newhouser on June 22, 1941. 2005 Bazooka #33 Carlos Zambrano (gold parallel). Our favorite burly, switch-hitting pitcher batting from the left side. 2007 UD Masterpieces # 46 Michael Jordan and #39 Frank Thomas (green border parallel). Surprised to find a recent Jordan baseball card, but a cool Chisox reminder, and The Big Hurt finds it easy being green. I like just about every card in this set, so will keep an eye out for them at the National later this month. The box yielded a few other parallels and serial numbered cards, but nothing to celebrate having or regret losing. If you're working on a set listed above, point me to the wantlist and I'll try to hit it! Today's superguest built his career across both phases of the NY/SF Giants franchise and eventually closed out with the post-'mazing Mets in the early 70s. 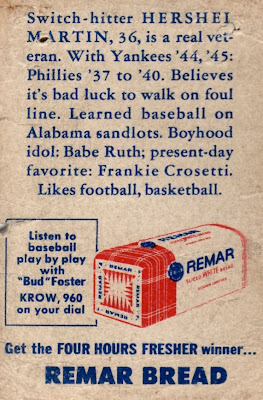 This "poor old baseball card," featuring a freshly-moved team, fits right into my low-grade 1958 set. The card itself sacrificed everything for some fairly sharp corners. Paper loss, glue marks, and tape residue? Check, check, and check. 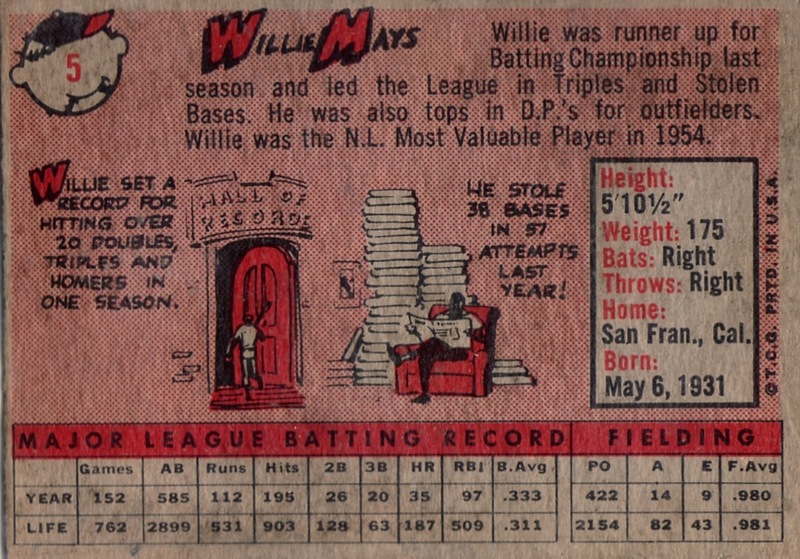 I'm tempted to get a ball-point pen and complete Mr. Mays' look with a "NOW A MET" update. 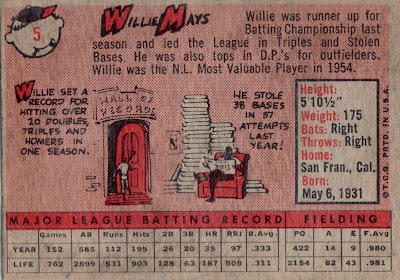 Topps leaned on the Say Hey Kid's popularity with 3 different cards in the 1958 set. 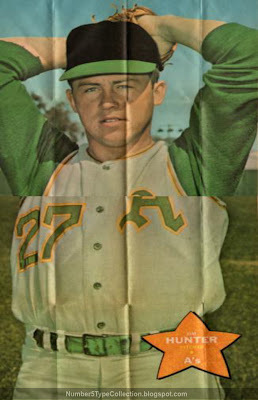 Along with #5, he co-starred with Duke Snider (#436, "Rival Fence Busters") and as a Sport Magazine All-Star (#486). I remain a little disappointed with 1958's design, given all the solid-color backgrounds and frequent sub-par posing. Think of the great 1956 design, 1957's good stab at full-color photos, and then compare it to these selections. Something about the one-note design set a low ceiling and lessened the chance to include any really great cards. Aaron and Mantle on #418 is pretty nice, but why is it vertical instead of horizontal? It's like sticking Baby in a corner. 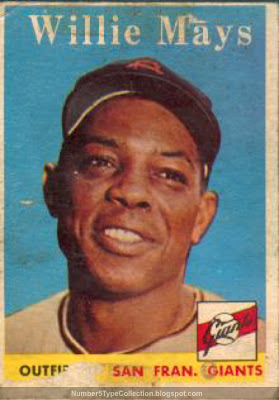 Overall, the overuse of close-up shots, omission of stadium backgrounds, and indistinct team photos place this release lowest on Topps' 1950s totem pole. I say, "Hey, let's look at that 1956 set again." 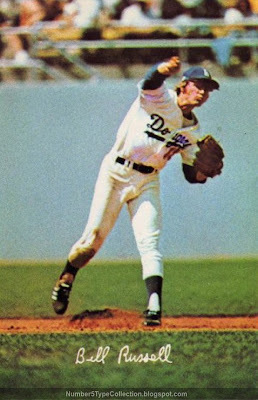 I like Bill's throwing pose, an unconventional release shot, though today's photographic quality would far exceed this card's somewhat blurry colors. 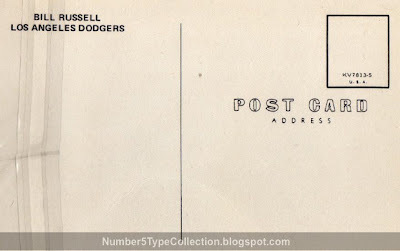 Russell played in the famous 70s L.A. infield with Garvey, Lopes, and Cey and also answers the trivia question, "who replaced Tommy Lasorda as Dodger manager?" The back's as blank as any postcard should be, aside from the address space and vertical divider. Can you spot the #5 designation? It's waaay up in the stamp square as a "-5" suffix. Beggars can't be choosers--a type card by any other name would fill the 4-count sheet just as well. 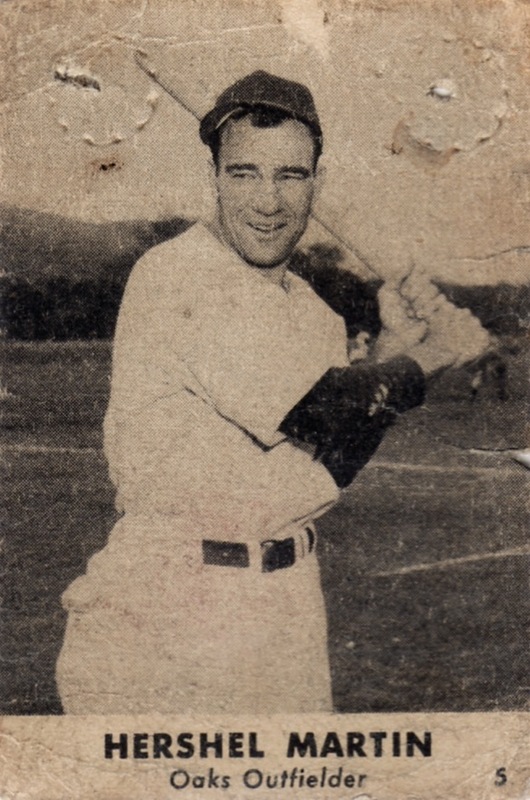 Earnest and always quick with the bat, today's guest switch-hit his way through a 6-year career with PHI (1937-1940) and NYY (1944, 1945), missing a few to the war in-between. He appeared (but didn't bat) in 1938's All-Star game as a reserve outfielder, the same year Gehrig made his final appearance before retiring in early 1939. Today, we sometimes tag the All-Star game as a piano recital of top performers for each league, where everyone gets a turn at bat and polite applause. In 1938, though, all but 2 starters played a full 9 innings. Gehrig pinch-hit (for 3B Buddy Lewis) and took over at 1B in the 5th, but rather than bow out, Jimmie Foxx simply moved over defensively to 3rd. Backup third-sacker (and Lou's NYY teammate) Red Rolfe stayed in the dugout. 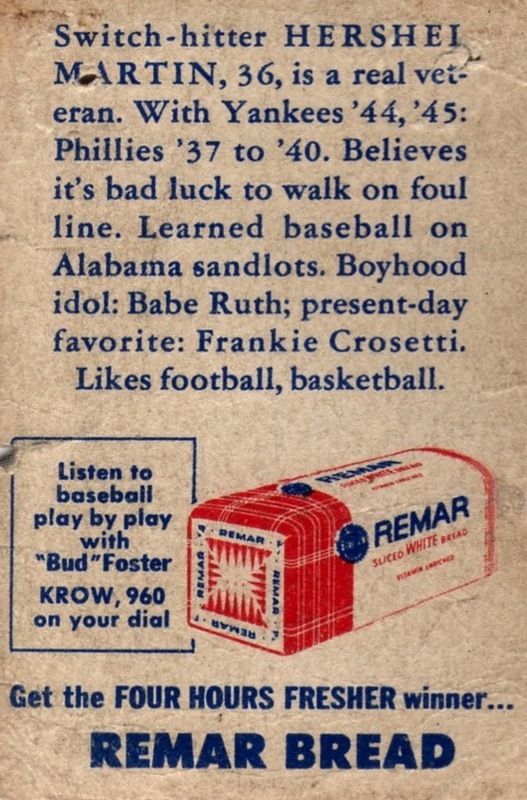 Check out the 1946 Remar set in the Virtual Card Collection for nice front and back scans of all 23 cards. Curiously, it contains 5 unnumbered cards; numbered versions start with Martin and continue to #22, Bo Palica. As a minor league set, individual cards don't cost a ton, but also aren't too easy to find. $10 and patience should net you a low-grade common.